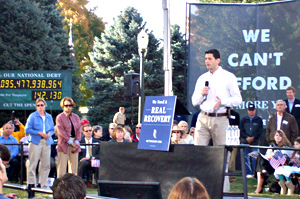 Republican VP nominee, Paul Ryan, speaks in Clinton. Republican vice presidential nominee Paul Ryan took questions from the crowd who’d gathered to see him this morning in Clinton — and one woman asked him to provide more details than Ryan shared during a Sunday morning TV interview on FOX News Channel. “You keep talking about China and jobs and then we talk about the unemployment, but where are the answers?” she asked. Ryan then spoke for nearly eight minutes about a variety of proposals, from trade to energy policy. AUDIO of Ryan’s answer to woman’s question. Ryan said deductions for charitable donations and mortgage interest would be retained, but the kind of tax “shelters” used by the wealthy to avoid paying taxes would be jettisoned. “The problem is it just took me about five minutes to go into all of this with you and when you’re on a 30-second TV show, you can’t do it as much,” Ryan said. Another questioner made reference to the “47 percent” Romney talked about in a speech to donors, asking Ryan if there was some way to make the 47% pay some taxes. Ryan said he’s not in favor of raising taxes on anybody and the way to end “dependency” is to create more jobs. Today’s event was staged on the lawn of the Clinton County Courthouse. 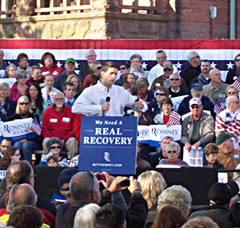 Ryan spoke for about 50 minutes, using a big screen to show slides of charts and graphs about the national debt, with a “debt clock” nearby. AUDIO of Ryan’s 15-minute speech to open his appearance in Clinton. AUDIO of Ryan’s 32-minutes-worth of Q&A with audience in Clinton. Ryan’s wife and kids, plus some extended family members are traveling with him today. He’s due to stop in Muscatine over the noon-hour and in Burlington later this afternoon.